My Google calendar reminded me several days ago that beehives should be wrapped on Thanksgiving. This year has been so warm and dry, it's not a big deal that I ignored it. Plus there's the fact that I don't have any bees in my hives. My point, however, is that no matter what tool or method you use to determine when to do what for your bees, it's important to be flexible and adjust to the situation at hand. I'm sure if I had bees in my hives, with this weather I'd likely be feeding. How about you? How's the situation in your beeyard? Thanks for the pointer to "How to wrap a hive" - there's some good info there. I used 2" foam insulation on all my top bar hives and 1" on my Lang (cuz I ran out of 2"). Someone I know with Hardison TB hives uses the roofing felt wrapping loosely draped on the sides and around the bottom and then stuffs it with straw for insulation as well. I didn't get my act together in time to try that (plus I had the 2" foam from last year). I guess we'll find out this week how the bees fare with the arctic blast this week! 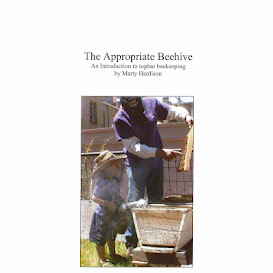 @Don, when we got our hive back from Marty it had been outfitted with a Hardison roof. As sad as I was that he'd accidentally killed our survivor colony, that roof made up for it. It is a piece of equipment that we could neither build nor buy. The pictorial does not show it well, but he makes his rooves with 1" rigid insulation supported underneath with pressed wood, framed with split 2bys. They are telescoping lids. He uses a jig to bend the final piece, a sheet of corrugated galvanized metal. With this design, the roof is heavy enough to withstand high winds yet light enough for me to maneuver. Sitting on my patio, I have observed how rain and snow is shed and the landing board is always dry. I've always been a believer of top-insulation and see the economic value of protecting the sides of a hive for from the elements. I use Sunbrella fabric for that. With my Warré, I used foilized bubblewrap under the fabric as well, as the bees never propolized the hive bodies together. But wrapping and insulating the bottom of a TBH seems odd to me. Makes me curious about their situation and specific challenges. The arctic blast seems as though it will be less severe than originally forecast. It'll by no-flying weather but there are no goose eggs in the 10-day! Remember a few years back when it was –19°F? I think we went 5 days straight without making it above 0°F. Even wrapped and insulated, that kind of weather would have me biting my nails. If the weather does turn and we find ourselves locked in a deep freeze, I recommend "Honey and Dust" by Piers Moore Ede for some Winter beeish reading. I think you'd enjoy it. I wrote a review on it several years back with a #WinterSolstice wish for my readers. I use the bubble wrap insulation on the top bars under the cover and the 2" insulation is for the sides and bottom. I have screened bottoms, so I insulate there also. For the hives insulated with fabric stuffed with straw, most of the straw is on the sides. She has insulation under lid also. I also inherited a hive that Marty made for her with an eco-floor that I'm anxious to test out next year. And it has one of his metal/insulated covers on top. I made a non-insulated cover with a metal roof a couple of years ago, using the pictorial as a guide to make the jig. That worked pretty well. Most of my hives have the plastic version of the corrugated metal. One comment about the metal lid is that wasps like to nest in there. In fact when I picked the eco-floor hive up, there was a wasp nest under the metal, above the wood. I put the wavy wooden strips that are used for the corrugated roofing material on the ends of the lid to keep wasps out. Funny you should mention that December cold snap. I was just talking with a colleague about that few minutes ago since he was asking how the bees do on a cold night like last night (I had 8 degrees). I told him that it's worse for them when we have the extended cold snaps like that one. Thanks for the pointer to "Honey and Dust". I'll have to check it out! @Don Good to know about the wasps! I wonder why they like the metal better than the plastic. Eco-floor. Is that the deep floor where there is a layer of "stuff" underneath to mimic a tree hive? They might like the plastic too, but I always have the furring strips on my lids. Yes, the eco-floor is just that, under the screened bottom. I've seen them with the Phil Chandler design, but never with the Hardison design until now. Very simple to do - I'll post about it some time. This will be a new adventure for me, so I'll let you know how it goes! @Don My Warré has a "sump floor" where sawdust can be added but thus far I have only used it to monitor varroa and cluster location since it's a screened bottom board. The one modification I'd like to make to my TBH is to give it a screened bottom board. Not an easy feat when your only tools are a circular saw and a Sawzall. Marty had a hive at DeLaney Farm with a reversible bottom, giving the colony a solid bottom for winter or a screened bottom for summer. I forget so will have to ask him why he didn't like it.